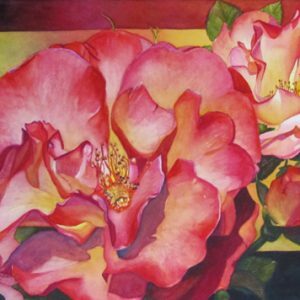 Thank you for attending the Oregon Society of Artists Rose Festival Art Show. The orange rose, Imaginations Light, won an honorable mention. This is always an honor. Thank you Geoffrey McCormack for selecting my painting. When I finish the paintings I am working on, I will get ready for Art In the Heart, the first Friday in August from 5 to 8 PM. 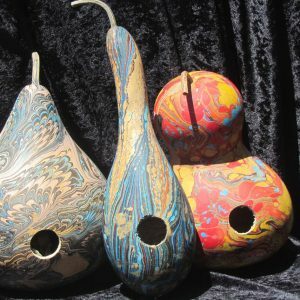 I will have marbled gourd bird houses, cards, a few paintings and other surprizes. I will be inside Art on the Boulevard (210 W Evergreen Blvd. #300 Vancouver,WA) for the festival. There will be artists all around town that evening. It is a wonderful event. There will be food, wine, live entertainment and good buys on local art. Please plan to attend this event. I have been paintings more florals, trying to get ready for my gallery show this September. It will be the first Friday in Septemeber at Art On the Boulevard, Vancouver, Washington. I will be part of a three watercolor artist team; Faye Kahn, Denise Joy McFadden, and me. You will love our show. Please put the date on your calendar, First Friday Art Walk, September 4, from 5 til 8. Please say hi and tell me you read about it in my blog. I have a signed special gift for you!